"The Kingdom of heaven is like this. A man happens to find a treasure hidden in a field. He covers it up again, and is so happy that he goes and sells everything he has, and then goes back and buys that field. Also, the Kingdom of Heaven is like this. A man is looking for fine pearls, and when he finds one that is unusually fine, he goes and sells everything he has, and buys that pearl." A husband comes through the back door after a round of golf. He is met by his wife who says, "John, you promised you would be home at 4:00. It is now 8:00." John quickly answers, "Honey, please listen to me. Poor ol' Roger is in the hospital. He was knocked unconscious by a stray shot on the eighth green." "Oh, that's awful," the wife replies. John agrees saying, "It sure was. For the rest of the game it was hit the ball, drag Roger, hit the ball, drag Roger." John had a goal that day - it was to finish the round of golf even if poor ol’ Roger wasn’t up to it. What are good worthwhile goals? what it is that you want to achieve by getting up and getting going? Keeping the house clean and tidy? Graduating and go into a career? Going to work each day and doing your best, perhaps aiming for a promotion? Getting the children through school? Being the best player in your sport's team? To get as much fun out of life as possible? Maybe you've never thought about it in detail and let life role along. There’s no doubt that when we are distracted from achieving our goals we can get very depressed and frustrated. But on the other hand, what excitement there is when our goals are achieved. Suddenly the sacrifice of leisure time and the effort put into a job are all worth it. Jesus picks up this whole question in two brief parables in our Gospel this morning. He simply says: "The Kingdom of heaven is like this. A man happens to find a treasure hidden in a field. He covers it up again, and is so happy that he goes and sells everything he has, and then goes back and buys that field. Also, the Kingdom of Heaven is like this. A man is looking for fine pearls, and when he finds one that is unusually fine, he goes and sells everything he has, and buys that pearl." Here are two men. Their goals became quite clear. One man is working a field; he’s been hired to plow the ground. Everyday he goes up and down the paddock making sure the furrows are straight, stopping every now and then to wipe the sweat from his forehead. His plough strikes something and bending down to get a closer look, he suddenly realises what it is - buried treasure. Apparently it was quite common to find buried treasure in those days. There were no banks or building societies as we know them today, so people would bury their most cherished belongings in pots in the ground. Sometimes the owners would die and the location of such a treasure would never be found. What is more, over the centuries Israel was invaded by enemies many times over, but before the invaders arrived people would quickly bury their belongings before they fled. Many did not come back to recover their treasure. When this man found such a treasure he hid it again, and then sold all he had and bought that field. By the way, he isn't doing anything underhanded here. The Jews had a "finders keepers" law. What Jesus is emphasising here is the extraordinary and overwhelming discovery that this man made and he was prepared to give up everything in order to make it his own possession. The goal of this ploughman is quite clear. He becomes single minded. He wants nothing else than to own this treasure. The ploughman did what anyone listening to Jesus that day would have done. Note that suddenly the goals of the ploughman have changed. Once his goal was to plough a field with straight furrows; now his goal is to get this treasure. To get this treasure he must first buy the field. Everything he owns is sacrificed so that he can acquire this priceless treasure. Jesus goes on to tell a story about a man from a very different socioeconomic group to the ploughman. This was not a labourer. This was an upper-middle to wealthy merchant who dealt in pearls. In Jesus’ day, pearls were more precious than gold or any other gemstones. The Roman Pliny, a contemporary of Jesus, tells us that Cleopatra had 2 pearls worth $4 million. Before Arab sheiks made their fortunes in gold, they made their money in pearls from the Persian Gulf. In his business of buying selling expensive pearls the merchant found one pearl of exceptional beauty. He was so delighted in this pearl that he sold everything he had and bought it. In this case the merchant would have been a man of substantial wealth, and yet it meant nothing for him to sell it all in order to buy that beautiful pearl. Jesus makes the point clearly – these men were single minded. They had only one thing in mind, to sell everything to get these valuable items. Now, Jesus isn't giving us a lesson on treasure hunting or on how to find priceless pearls, but he is talking about the kingdom of heaven. He is talking about the change that came into the lives of the ploughman and the merchant after finding something that was priceless. Jesus is speaking today to people who are like the ploughman. You have been ploughing for months, maybe years, laying down straight row after straight row in the same field. Going to work, doing your best, coming home, trying to be a good parent, going to church and on it goes. All you see before you and behind are the furrows, all the same, moulded by your ploughmanship. In that you can find some sense of satisfaction, some sense of meaning and purpose. But you wonder, "Is there more?" The message of the parable says that "yes! There is more!" 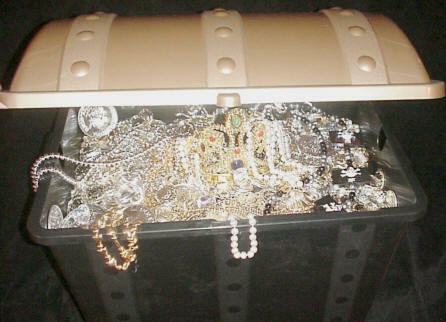 There is treasure, priceless, invaluable treasure. It’s a treasure that is there waiting to be found. It is a gift from God. It is the priceless treasure of Jesus our Saviour. The treasure is the death and resurrection of Jesus. Through no merit, work, or worthiness on his part whatsoever, without his doing anything, the ploughman is suddenly a millionaire several times over. Through no merit, work, or worthiness on our part whatsoever, Jesus died in our place and the forgiveness and eternal life he gives is the most valuable treasure that we could ever wish for. This is a gift of grace. These parables of Jesus also tell us that with the gift of the gospel there is also sacrifice. The common theme that runs through both these parables is the response of both these men. Their goals in life changed. These men sacrificed everything they had. let nothing stand in the way of getting the treasure or the fine pearl. You might sum it up like this - no sacrifice - no treasure or priceless pearl. Jesus spoke about sacrifice and commitment on quite a number of occasions. He pointed out the necessity to surrender everything that stands between God and us. Take these words of Jesus for instance: "Anyone who loves his father or mother ... his son or daughter more than me is not worthy of me; and anyone who does not take up his cross and follow me is not worthy of me" (Matthew 10:37,38). These are powerful words about commitment. Remember the cross demanded total commitment from Jesus and he is here urging total commitment from his followers to "take up their cross" "and anyone who does not take up his cross and follow me is not worthy of me". Or think of Jesus' response to the rich young ruler who came wondering what he had to do to have eternal life. Jesus answer was, "Go, sell everything you have and give to the poor, and you will have treasure in heaven. Then come, follow me" (Mark 10:21). Jesus was telling this rich young man that nothing is to come between him and God. There was something more important than anything or anyone else in his life – his relationship with his heavenly Father and his place in the Kingdom of God..
God has given us a wonderful world and given us so many wonderful things in our lives to enjoy and appreciate. It's true that too often we get things out of perspective. We look at the things that God has given us as the great treasures of this life. And when I say things I include everything you could imagine, our homes, our families, our sport's team, our education, our leisure, our work, our hobbies, you name it. And if I said to you: "Hey, your sport's activities, or your concern for your house, or whatever, are interfering with your relationship with Christ" you might get offended and tell me to go and mind my own business. But I am speaking today not my words but the words of Jesus himself. Think of the four fishermen - Peter, Andrew, James, John. They left everything they had - boats, nets, the family business - to follow Jesus. Think of Matthew, the tax collector, who heard the call of Jesus, closed his tax books, hung a sign on the tax office door that read, "Gone fishing" and went off and followed Jesus. They leave the old life behind and follow Jesus in complete obedience and faith. Nothing stands in their way to following as disciples. from our commitment supporting the work of this congregation with our time and abilities. We are challenged to sell out on everything that detracts from our loyalty and service to Christ. As we look at ourselves we realise how poorly we have responded to the love of Jesus and how slack we have been doing God’s work. And once again we appreciate what a priceless treasure we have been given in God’s gift of Jesus. The Gospel, the Christ on the cross, the glorious resurrection - that is our priceless treasure. Again we see that this treasure is the most important thing we can have for this life and the next. Rejoice in it.